Taklon is a type of synthetic filament that is dyed and baked to make it softer and more absorbent. Exceptionally easy to clean, this economical grade of Golden Taklon is a great choice for oils and acrylics because it withstands the caustic nature of solvents and acrylic paints better than animal hair for greater durability overall. 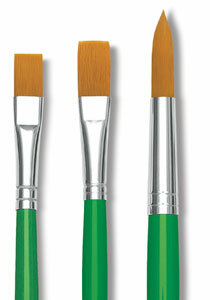 These brushes have natural wood handles in a green gloss finish and seamless polished aluminum ferrules. 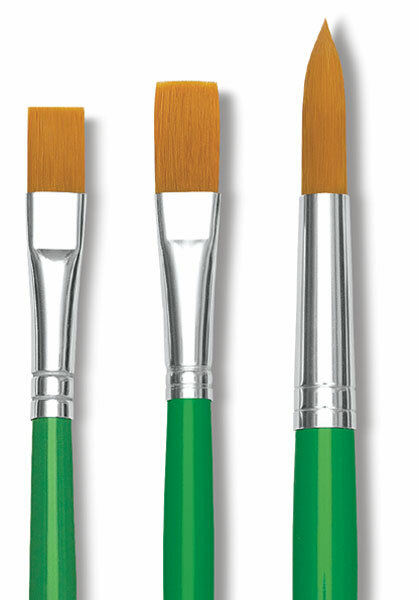 Flat, Canister of 108 — Contains 108 Flat brushes, including sizes 2, 4, 6, 8, 10, and 12. Round, Canister of 144 — Contains 144 Round brushes, including sizes 0, 1, 2, 4, 6, and 8. Bright, Set of 6 — Save with a set that offers a range of sizes, including sizes 0, 1, 2, 4, 6, and 8. Flat, Set of 6 — Save with a set that offers a range of sizes, including sizes 0, 1, 2, 4, 6, and 8. Round, Set of 6 — Save with a set that offers a range of sizes, including sizes 0, 1, 2, 4, 6, and 8.